Dealing with data related to your business can feel a little overwhelming when there’s so much of it. Spreadsheets allows you to break this data down into useful information, and can save you a lot of time in the process. 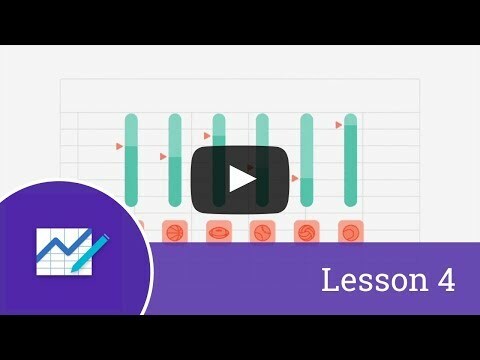 During this lesson we will cover the benefits of using spreadsheets, introduce basic functions, and explain and these functions can be used to help you manage specific data. So let’s start with the basics: What is a spreadsheet? A spreadsheet is defined as an interactive software application designed to help organise, analyse and store data. Put simply, spreadsheets create a grid of data, using a principle of rows and columns. Once numbers are added into the spreadsheet, you can use automated tools and functions to analyse the information and find the answers you are looking for. Spreadsheet software like Microsoft Excel, Google Sheets and Apple Numbers are incredibly useful when dealing with large amounts of data, such as financial budgets, project plans and databases. For example, if you were in charge of collating census information for a town, you could use a spreadsheet to keep track of addresses, names, dates of birth, and how long residents have lived in the town. You could then apply a filter to work out how many people are under the age of four; which would be valuable information to consider when planning school capacity. Information can be presented in different ways. For example, you could produce a graph highlighting the population of the town based on gender or a table showing the different age groups that attend local sporting clubs. Filter tools allow you to quickly organise your data into a specific order, whether that be alphabetically or by date. Not everything in a spreadsheet is just a plain number. Percentages, currency, dates and duration are just some of the common formats you can use depending on your data. Functions can be used to instantly recalculate values based on a change. Applied to the census example, you could create a formula that would automatically work out the average age of the town at any point in time. There are many functions and formulas built into spreadsheets - with many of the basic ones available in all popular spreadsheet software. Let’s take a look at some functions that could help you to organise and make sense of the census data. The function SUM() allows you to calculate the total of two or more spreadsheet cells. This is handy if you wanted to know the total number of people in the town. Average, or “AVG()” returns the average of the numbers selected. It could be used to work out the average age of the town’s population. The COUNT() function counts how many times a certain value occurs. For example, the number of people who have lived in the town for three years or less. This might give you a good indication of the amount of people moving to the town. Now that we’ve explored how spreadsheets can help you manage and analyse your data, spend some time considering how you could utilise them in your business scenario. Explore which functions can save you time, and which spreadsheet features can put your data and insights to good use. basic spreadsheet formulas that can help make life easier.